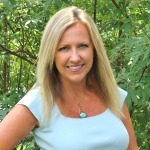 One of the top questions I receive by readers is, “Help Kim! 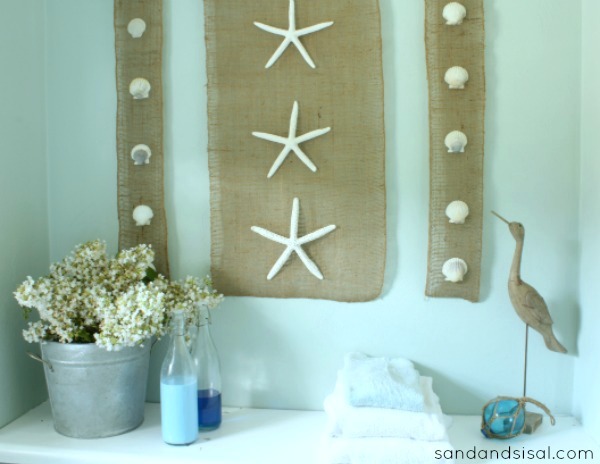 How do I decorate coastal when I don’t live anywhere near the shore?” Decorating coastal is easier than you might think and we are going to explore a few ways How to Decorate Coastal in your home. This week, 25 talented bloggers are sharing their tips and tricks in a “How to Decorate” series hosted by Beth from Home Stories AtoZ (a.k.a. my little sister). When you hear the word “Coastal Style”, many different images and styles might come to mind. Hopefully parrots, bright Hawaiian prints, neon palm tree lights, tiki bars, and pink flamingos are not your first thoughts. 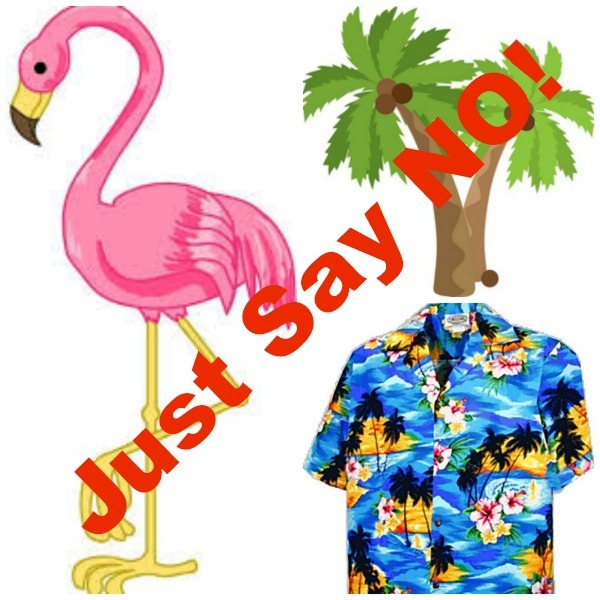 I think we all can agree that will want to avoid the whole “Margaritaville” look in our homes, right? American Coastal Style should evoke a mood or a feeling of casual, breezy, seaside relaxation without bashing you over the head with beachy paraphernalia. American Coastal Style can be broken into subcategories like transitional coastal (my style), coastal cottage, and contemporary coastal. 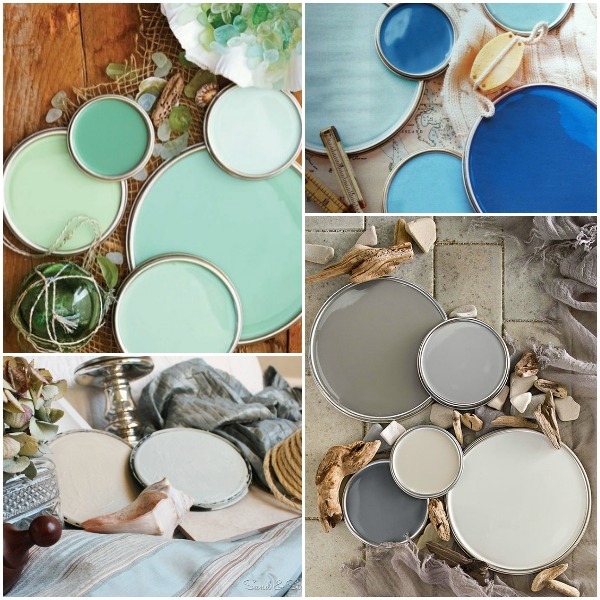 Regardless of which sub-style you prefer, they all have several things in common, tons of natural sunlight, casual furnishings made with natural fibers and textures, ocean inspired color palettes, touches of subtle sparkle from glass and mirrors, and “found”, natural elements from the sea or coast as decor accessories. Choosing the right colors for your walls and decor will immediately help transform your home and give it the feeling of a relaxed coastal environment. The ocean, sky, and sand provide the inspiration for a coastal color palette. Watery sea blues and aquas and.. Deep navy and steel grays like the storm clouds over the turbulent oceans. 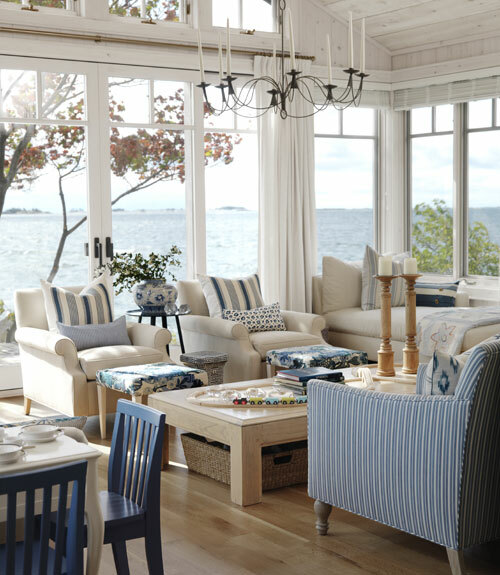 Coastal Decor celebrates the sunlight and beautiful vistas. 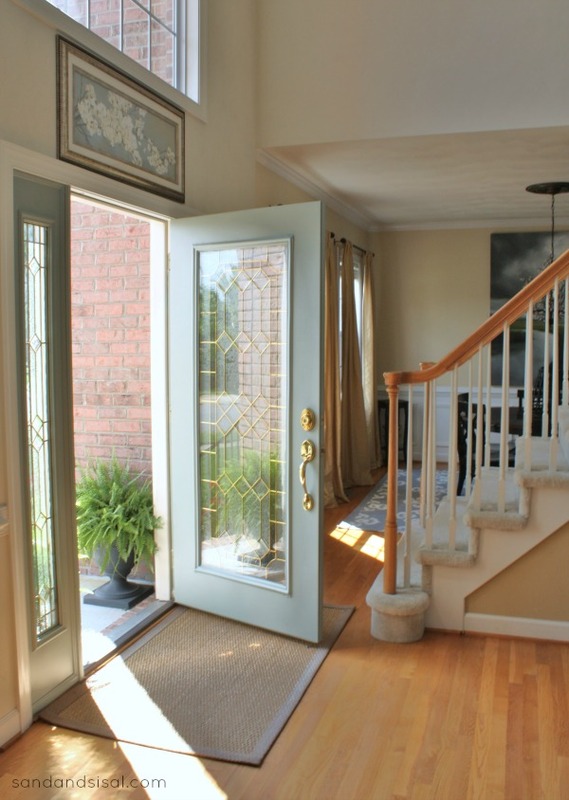 Coastal homes have a multitude of windows allowing natural light to be the main source of illumination in the home. 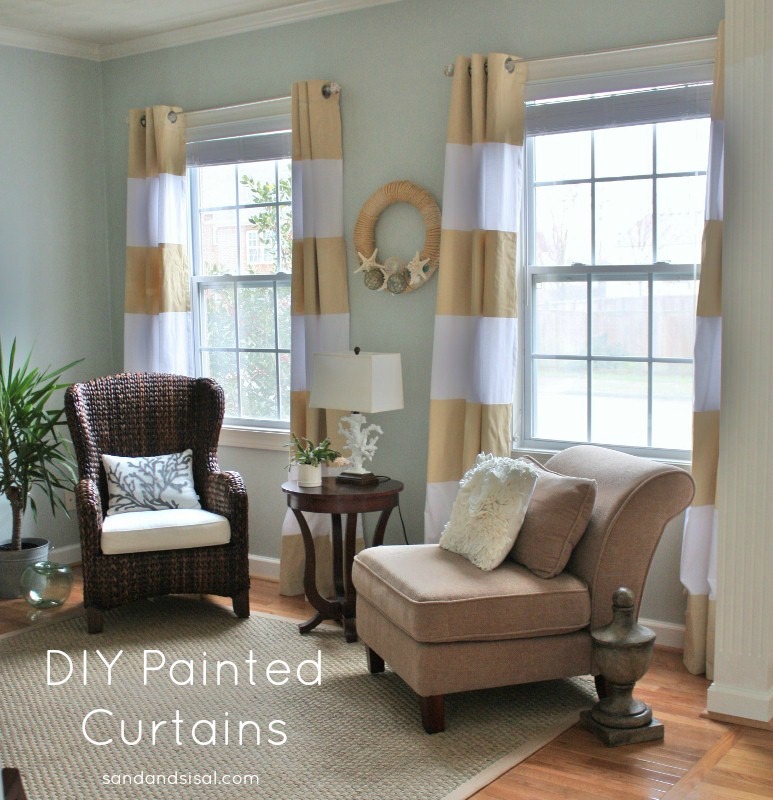 Window treatments are kept simple, light, airy and are rarely ever closed. Think about it, have you ever walked into a beach home that was dark and gloomy? I hope not. So even if you live hundreds of miles inland, go ahead and push back those drapes and let that glorious sunlight pour in. Who would want to obscure a gorgeous beach view anyway? The furniture in coastal decor is anything but stuffy and ostentatious. It should be comfortable and casual, but this does not mean you need to sacrifice style and elegance. Choose natural fibers like rattan, cane, or sea grass for chairs, and jute, sisal, sea grass, or knotted wool for floor coverings. Slip covered sofas dressed in linen or cotton help keep the look casual, but with kids, a durable utrasuede or outdoor fabrics in sandy shades work well and are practical. Keep linens simple, crisp and clean, and light. 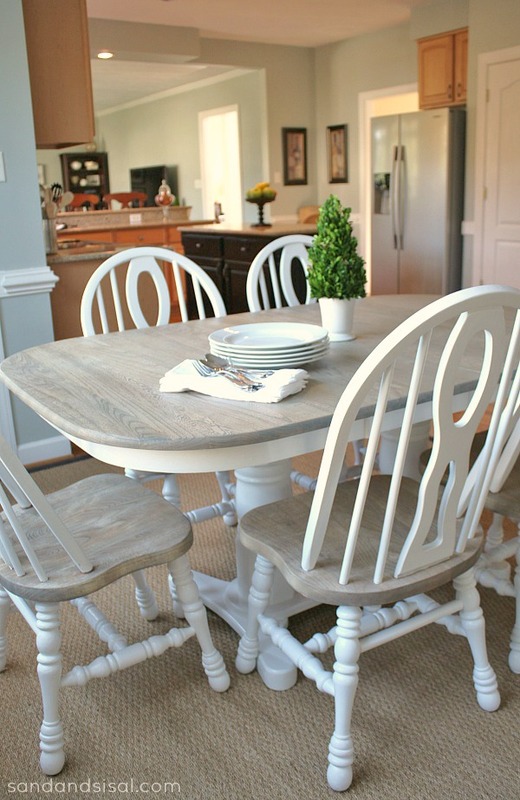 And bring in hand painted, distressed accent pieces to round out the look. To bring a coastal cottage look to your home, dress the walls with painted white woodwork detail like board and batten, bead board wainscoting, and white washed paneled walls. Try to keep wood flooring and tables in a light finish. Think weathered wood, driftwood tones, whitewashed, natural maples, ash and bamboo. A few darker stained pieces of furniture strategically placed can help anchor a room that is full of lighter tones and palettes and doing so moves you into a more “traditional or transitional coastal style”. 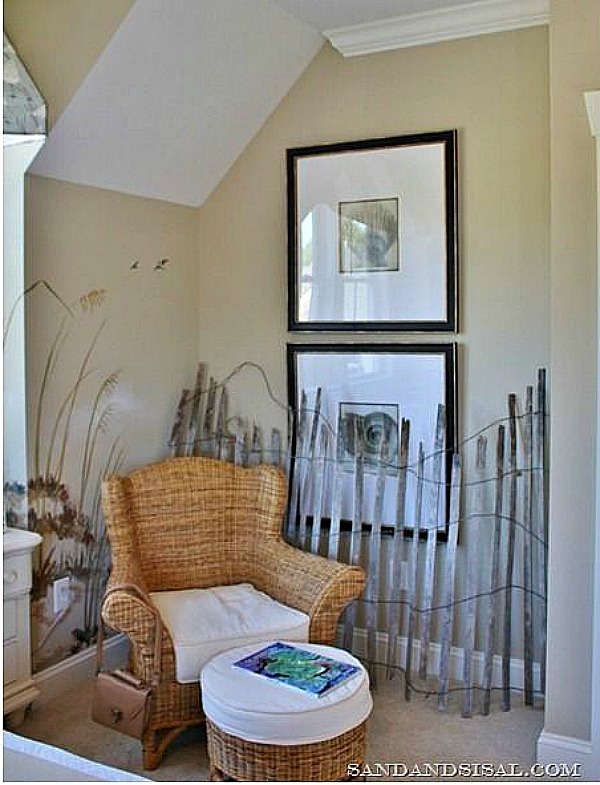 Transitional coastal style works well and makes sense if you live in the middle of the country, no where near the coast. Accessorizing is my all time favorite part of decorating! I believe implicitly that decor crafting can be as classy and beautiful as you desire. Adding coastal accessories and art is where YOU get to express your family’s memories, keepsakes, and treasures. We all have little (or large) bags of shells, stones, sea glass, and driftwood that our children (or we) have found during beach-combing. 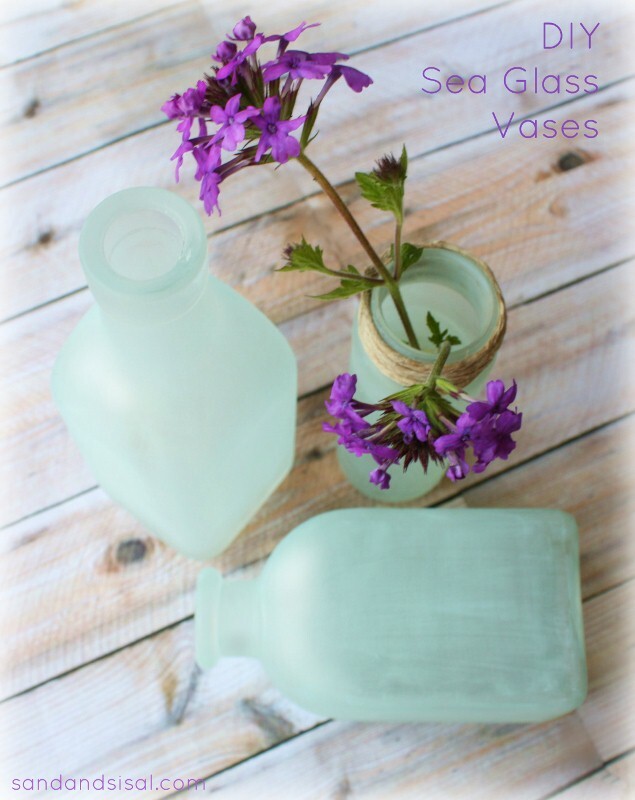 Pull those simple little treasures out and create memorable art and displays with them. 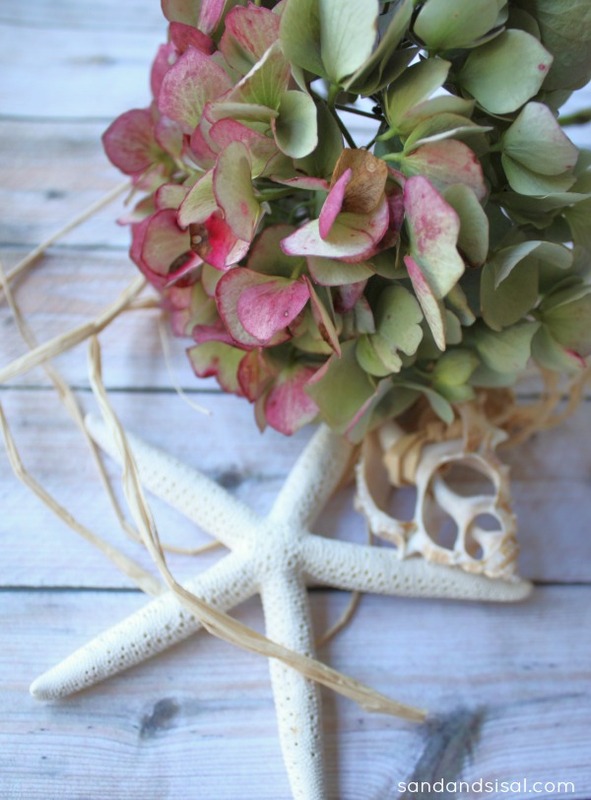 Coastal Accessories can be sea life, shells, sand, sea fans, coral, driftwood, etc. Look for nautical or coastal prints on throw pillows, dishes, glass ware, or artwork. 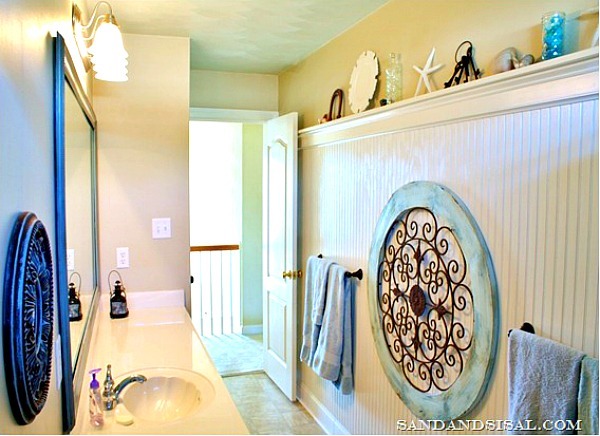 This is THE area where you can add expressive coastal touches. Go ahead and toss in that sequinned studded octopus throw pillow! You want to install a starfish chandy dripping in rhinestones? Sure! Why not! Decorate with what you love, with what evokes amazing memories. THIS IS YOUR HOUSE! EXPRESS YOUR INNER COASTAL SELF AND ENJOY! 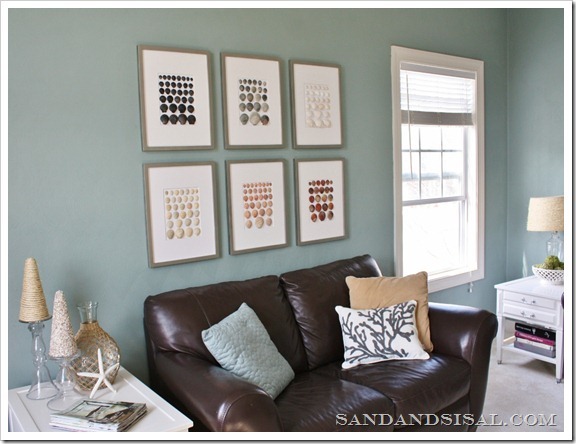 An easy option for coastal art is to sort out all your shells by color and size and glue them onto matted frames, creating your own DIY Shell Art. 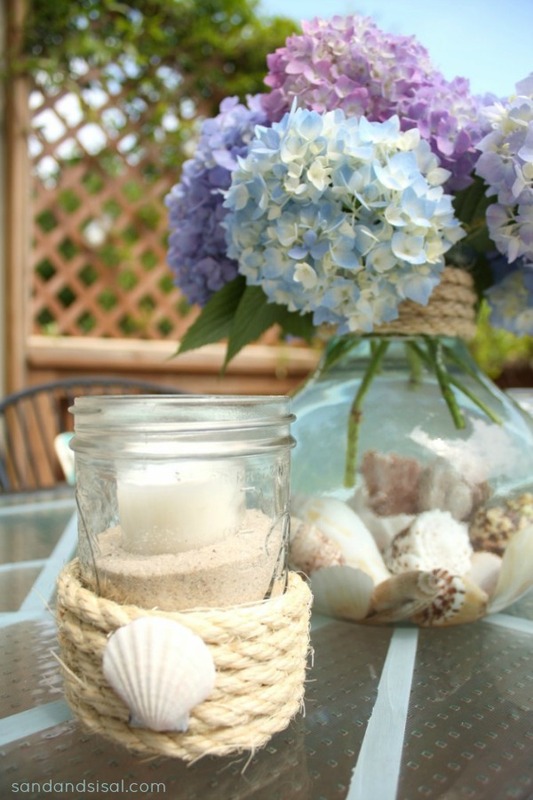 Fill a vase with clean shells and flowers for a simple yet stunning summer centerpiece. Most of Sand & Sisal is about coastal decorating, so if you are still need a bit more help with how to decorate coastal then please feel free to double click on any of the pics to be taken to fun and informative tutorials on how to replicate the look in your home. 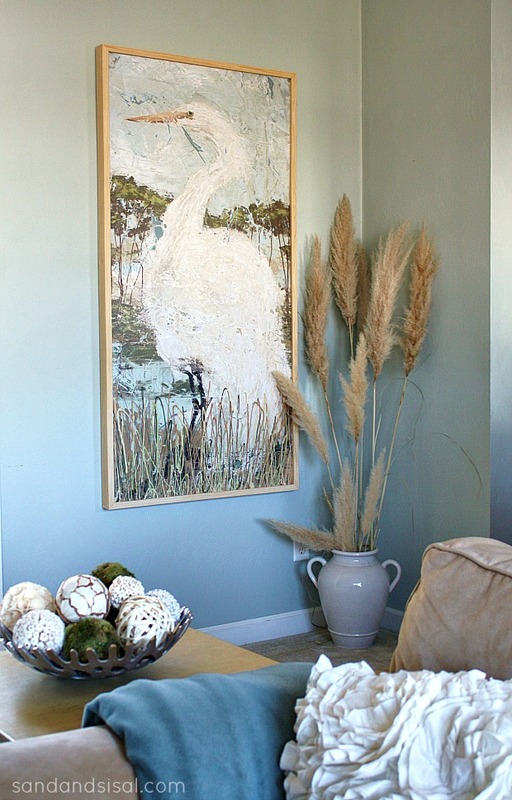 Follow Sand & Sisal on Pinterest and check out my Coastal Decor pin board full of amazing coastal projects and images. 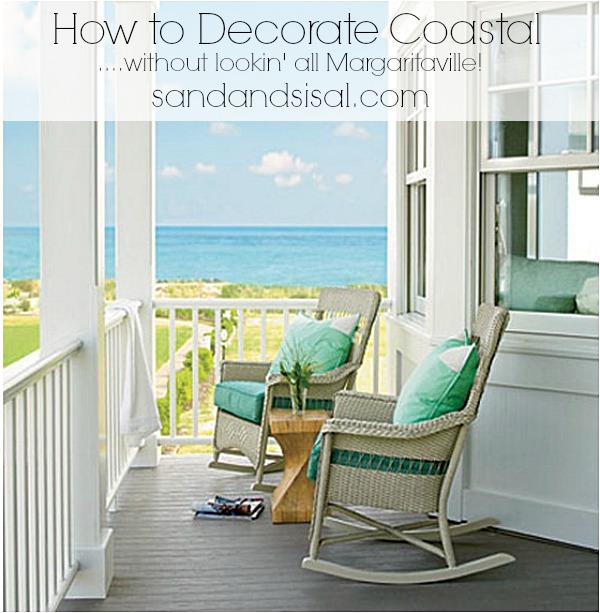 Follow Sand and Sisal’s board Coastal Decor on Pinterest. The How-To Decorating Series is the perfect place to get inspired! Kim, your home is beautiful!! 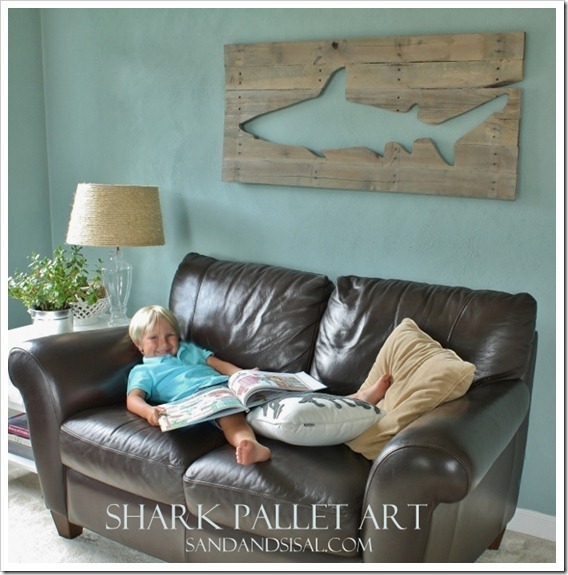 Love your coastal decor and awesome projects! I agree with Debbie! Such a beautiful home! We live in Central Illinois–nowhere near water. We LOVE coastal decor though. Our friends don’t understand why we want to decorate coastal while we live in the middle of corn and bean fields. We decorate with what makes us happy:-) Thanks, Kim, for being such an inspiration! Smiling at the ‘ do not’. So many people make the mistake of going kitschy to get a beachylook. Luv your subtle coastal, inspired look . The greens and blues … Beautiful. So cool and summery. Love the title of this post and the “just say no” section makes me laugh! 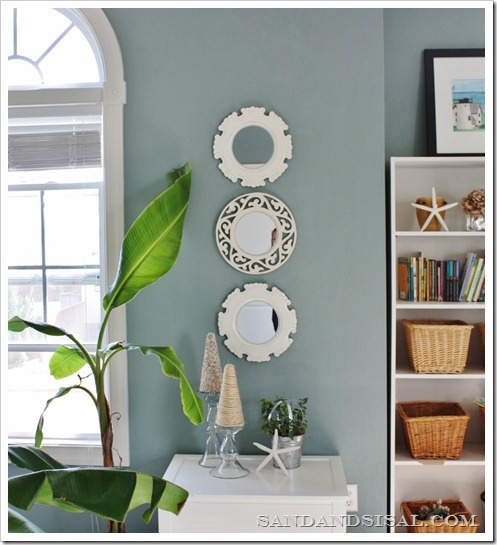 You have definitely nailed the coastal look in your home. 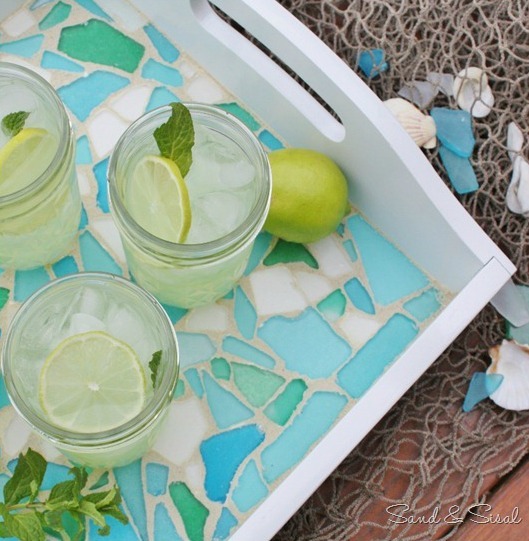 I like to add coastal elements to my home but I always make sure I don’t do too crazy either! 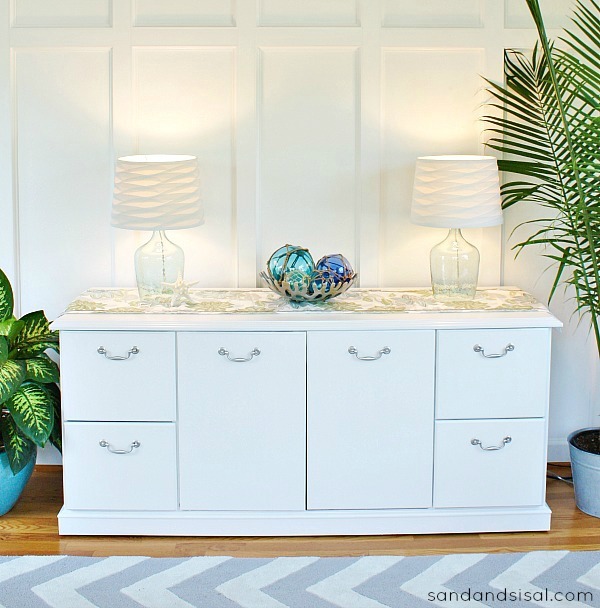 Fantastic tips and you know I love your home and style! 🙂 Thanks for joining my series. Kim you do coastal right….BEAUTIFUL!! 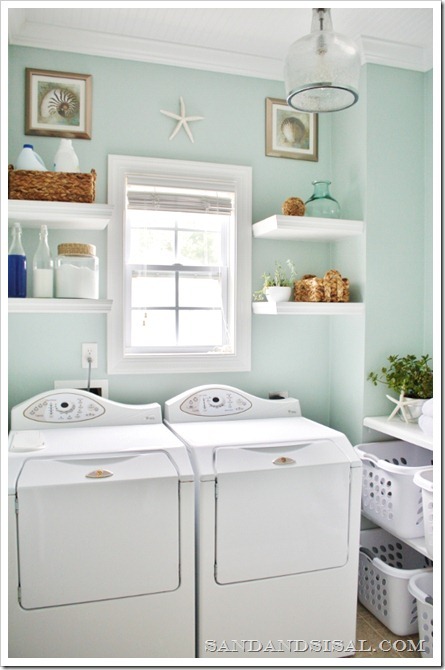 Great post and I love your chic classic coastal style. Not kitchie at all. Love all the coastal ideas!! !